Personally, we can’t get enough of Paris. But the key to enjoying this timeless cityscape is to go beyond iconic landmarks like the Eiffel Tower and the Louvre (and the exhausting lines they are synonymous with) in favor of authentic brasseries, quirky museums and unexpectedly captivating corners of the city. 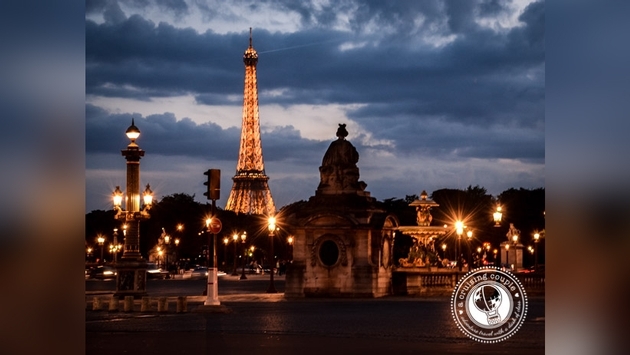 Paris is often touted as one of the most romantic destinations in the world. But if you’re looking for a slightly creepier vacation vibe, try a visit to the Paris Catacombs. 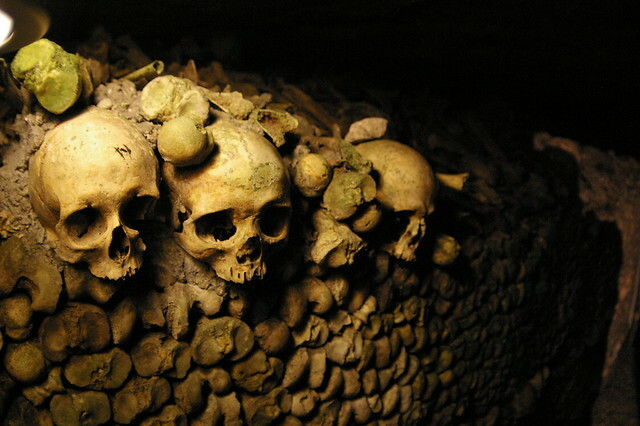 The Catacombs are a 170-mile network of caves, tunnels and quarries beneath the city, filled with the skulls and bones of nearly 6 million deceased. The maze of tunnels is surprisingly easy to get lost in, and numerous horror stories of what could have transpired in the dark and cobwebbed corridors have long sent tingles down visitor’s spines. That said, tourists must follow a designated path, with the majority of the catacomb network not open to the public. This historic cinema dates back to 1921, but it was only recently refurbished and re-opened to the public in late 2013. Le Louxor hosts a range of films, with early premiers, cinema workshops, children’s séances, concerts and a local cine-club. Don’t miss the notable Egyptian influences throughout the theater, a tribute to the building’s early Egyptian-inspired art deco design. In this one-man English comedy show, learn how Parisians view the stereotypical tourists who come to their city. It’s recommended to book tickets in advance as this show has smashing reviews. 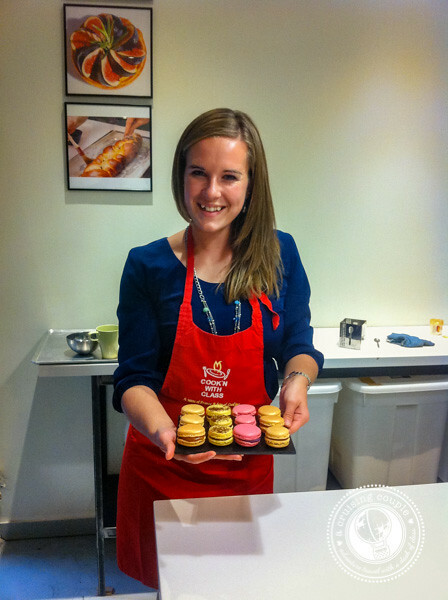 One of our favorite things about any visit to France is getting to indulge in sweet and colorful macarons. And what better way to enjoy them then after learning how to whip up a batch for yourself? Making these decadent bites is quite labor intensive (think: three hours under guided instruction), but this unique French experience remained a highlight of our last trip to Paris. And while we’re talking about food, why not enhance your knowledge of French food and wine by taking a personalized food tour through one of Paris’ most romantic neighborhoods, Montmartre? You’ll be taken on a culinary journey that includes a 100-year-old restaurant, flowing wine, and a creperie that serves some of the best sweet and savory treats in the whole city. You can read more about our Culinary Tour in Paris here. Many people are unaware that just a 45 minute TGV ride from Paris can find you spending the day “tasting the stars” at the world-renowned Champagne Houses in Reims. Don’t miss such venues as Veuve Clicqout, Pommery and Lanson; be sure to make your reservations for the champagne tours and tastings in advance as they are required almost everywhere. If you have a bit longer than a day to explore, this guide to Reims (and the Champagne Houses) can help you plan your itinerary. With its plethora of bookshops and literary history, Paris is one of the best places in the world for a bookish escape. 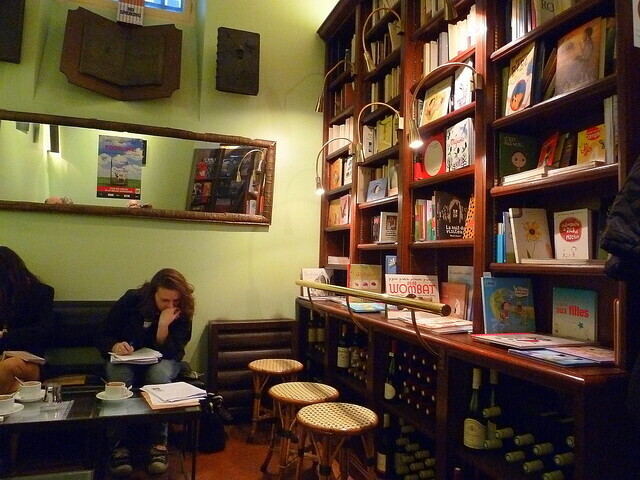 La Belle Hortense tops our list of favorite bookshops. Here you’ll find everything from new releases to independent poetry along with the classics. The walls are lined with not only books, but also bottles, meaning you can find inspiration leafing through a novel while simultaneously sipping a glass of vino. If you’re a big bargain hunter, a visit to one of Europe’s largest flea markets is a must. St-Ouen Market has over 2,500 stalls divided into 14 specialty groups. You’ll need plenty of time and patience to devote to this market if you want to find something truly worthwhile, but you’ll be rewarded with a uniquely one-of-a-kind Parisian purchase. Definitely not your everyday museum, the quirky Funfair Museum boasts a variety of amusement park memorabilia dating back from 1850-1950, including rides, carousels, merry-go-rounds, swings and more. The collection includes a glimpse into the biggest world fairs of the 20th century, Italian opera and, of course, a special tribute to 19th century funfair. If you’re a Hemmingway aficionado, consider using your Paris vacation to revisit some of his favorite spots, including where Hemmingway mingled with the greatest artists of his time and found inspiration for A Moveable Feast and The Sun Also Rises. A Guide to Hemmingway’s Paris will uncover cafes, restaurants, and even hotels and landmarks immortalized by the author. If you’re looking for even more inspiration on your next trip to Paris, don’t miss our ultimate guide: 50 Cool Things to Do in Paris. What’s your favorite off-the-beaten-track activity in Paris?